The author alone in the Porcupine Mountains. We've all read the warnings in outdoors publications: "Don't go alone." It's good advice, anything that can happen will, if you tempt fate enough. But on occasion you need to ignore common sense and head out by yourself. There are rewards, but to receive them, you have to take responsibility for yourself. These days most of my lone trips are taken in my fishing kayak and are on fairly well-used recreational rivers or lakes. There's also the ultimate umbilical cord, a cell phone. I carry mine most of the time, even though I don't always have a connection. It doesn't worry me, I wandered in Michigan for more than 30 years without one and I'm alive to tell my story. I yearn for the days when I wasn't connected. There was more of a sense of adventure, dangers to overcome and a sense of accomplishment when you finished a solo trip. I'm glad I had my basic training during the unconnected era. These days, people are prone to get into trouble because they think a GPS and cell phone will get them out of anything. It makes them reckless. When you know it's just you, more thought is put into your actions. Over the years, I've taken two lone significant off the grid trips, and countless smaller ones. All have been rewarding, but the two long ones helped guide me through difficult times in my life and set the tone for things to come. Since I saw no one for a week on each trip, I've learned how to be alone in the woods and enjoy it. I also learned to move slowly, so as not to hurt myself. Those are lessons I used in my shorter ventures. When you go into the woods alone, you never come back the same. It's like a temporary stint as a hermit. A favorite nature writers, Sig Olson wrote an essay on hermits he'd met in northern Minnesota and Alaska and concluded that some are nuts, especially those who don't come out of the woods. It's important for those who come back to tell their stories so others can learn to be alone. I'm trying to do that. My first long, solo trip laid the ground work for much of my life. 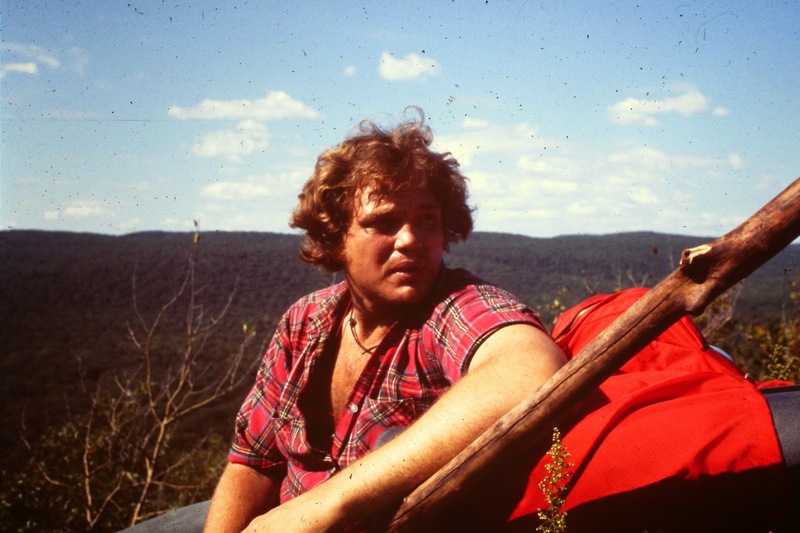 It was a backpacking venture in the Porcupine Mountain Wilderness State Park in the mid 1970s. I was living in Bay City Michigan, and my wife had family obligations in Detroit for a week, so I headed north. 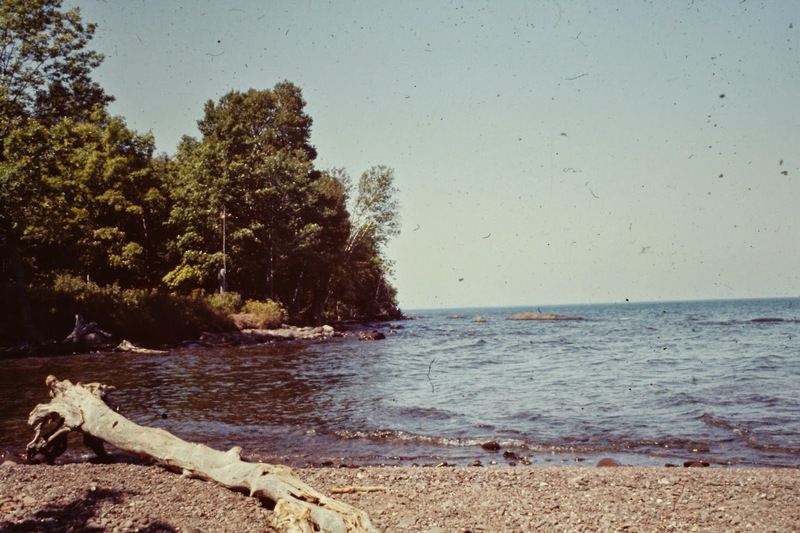 I'd backpacked once before, nearly a decade previously on Isle Royale, but had a companion, plus there were lots of people on the island, and I expected the same in the Porkies. Lake Superior in the Porcupine Mountains. Backpacking was experiencing a boom then, with lighter equipment, better camp stoves and freeze dried foods. I expected the park to be well used in late August. It wasn't. I spent six days without seeing a soul and it tested me. The first shock was a warning from a park ranger to watch out for black bears, as a camper had been attacked by one a few weeks previous. The hiker was cooking in his tent, a dumb move, especially that year because the DNR had closed most UP dumps where the bears fed by ripping open plastic garbage bags. To bears a small tent with the smell of food on it looks just like a garbage bag. My first night was spent in a cabin, of which there are several in the park, and I safely slept without fear of them, but there were visitors -- mice. They ran through the place looking for scraps of food left by hikers. I used a flash light to keep them at bay, but didn't get a lot of sleep that night. Small feet make big noises when you're alone. I knew about the bear danger, and had tied bells to my boots to warn them I was coming, but I worried they weren't loud enough as I hiked the next day. When I entered brushy areas, I swore I could hear them, although I never saw one. The next night, I opted for my tent, no mice there. The camp site was in view of Lake Superior in an open area, so I could see if bears were around. I collected enough wood during a short walk to make a small camp fire, mostly for reassurance. It was in the 80s, and humid, with the look of rain. I got a decent fire going, and retired to my tent hoping the blaze would keep interested bears away. The thunder started rolling over the lake and there were lightning strikes, but the fire reassured me I could dry out, if needed. A gust of wind hit, blowing the logs out of the fire pit and they rolled in all directions, sparks flying, a scene from hell. It was only after I hiked out that I discovered a tornado had moved through the area. Without a cell phone or weather radio, I didn't know if I'd been in the middle of it. Perhaps that was good. As the week moved along, I got accustom to being alone, and spent time taking pictures with a heavy, old school, metal Nikromat camera. The slides still have brilliant color. The experience was strong and confusing. Something powerful happened to me, I knew it at the time, and for decades I was afraid to tell others for fear they'd think I was nuts. But in my 60s, those fears vanished. I've embraced my crazy side and don't care what others think. I know what happened to me, it was a Native American vision quest. I realized that when I read Indian myths. Young Native Americans went into the woods alone, fasted for days and waited for spirits to visit them. Mine were fire, storm and black bears. Powerful stuff to be inside your head. Those spirits told me not to be afraid when I was alone in the woods. That was about 40 years ago, and the spirits are still giving me good advice.